Mark Meshulam’s inside scoop on window glazing and window glazing leaks. [audio:http://chicagowindowexpert.com/audio/glazingleaks.mp3|autostart=yes]The word “glazing” has multiple meanings where windows are concerned. Glazing can be a verb, meaning the act of installing glass into a frame. Glazing can refer to the portion of the assembly which contains the glass or other glazed-in panels. Glazing can also refer more specifically to the means by which the glass is installed, and especially sealed to the frame. This third definition is today’s topic. Window glazing leak at wood window. Arrows indicate distinct areas of water leakage at top, bottom and seams of interior glazing stops, also known as glazing beads. Seasoned window professionals have been heard to say – usually over a beer after a hard day of windowing, “Glass doesn’t leak. Aluminum doesn’t leak. It’s the stuff between them that leaks.” Very true. 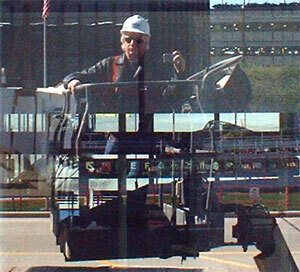 Glass and aluminum are non-porous, water-impermeable materials. The only way water can penetrate windows, then, is through the materials, or lack of materials, which are intended to seal aluminum and glass to one another. Components of an aluminum window. Manufacturers will vary. 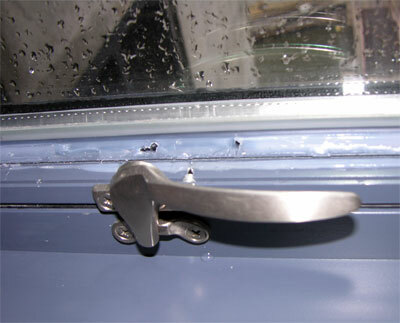 A “glazing leg” on the frame against which the glass rests. A spacer tape or sealant tape which is applied to the glazing leg. The glass itself, which is placed and compressed against the spacer tape and glazing sealant. In addition to the above, some glazing systems have an additional line of sealant between glass and frame at the inboard plane of the glass. This is called the “heel-bead”. Occasionally one might see a line of sealant applied to the exterior of the glass where it meets the glazing leg. This is called a “cap-bead”. Heel bead leak. Holes in heel bead visible with glazing stops removed. The heel bead defends the exterior sealant line from differential pressures which might draw water through the glazing system, reducing the potential for water penetration. If water does penetrate the exterior line, the heel bead can prevent the water from coming into the building. With a two-line system it is important to have “weep holes” beneath the glass to allow any water which might penetrate the exterior line to drain harmlessly to the exterior. The most common occurrences of glazing leaks involve holes, adhesion loss or discontinuities in either of the sealant lines. The second most common occurrences will involve a lack of, or clogging of the weep holes beneath the glass. If water is allowed to be present beneath an insulated glass unit without adequate drainage, the water can degrade the insulated glass seals and cause premature seal failure, where water vapor enters the glass airspace and “fogs” the glass unit. A fogged unit will need replacement, which is expensive. If water is allowed to be present beneath the glass without adequate drainage, it can also prematurely degrade the joinery sealant at the frame corners. Another frequently seen glazing problem involves blockage of the drainage path. The glass edge sits on hard rubber “setting blocks” at the bottom of the glass and sometimes at sides and top also. If these setting blocks are fitted too tightly into the space around the glass, especially at front and back edges which might be embedded in the glazing sealant, the water drainage path can become blocked entrapping water within the system. Plainfield, Illinois in October 2007 with “Visions” vinyl windows. weather & the problem will re-occur. long as the inside seal? But the first question is, did this application stop the leak? the repair, does the same test produce a “pass” now? concern becomes long term wear. and do an adhesion test. Also, the drainage path of the glazing area should be verified. Thanks for your quick reply. The application did stop the leak. My concern is definitely long term wear. I don’t want to do this every 5 years. You have an incredibly informative web site. I have a window seal problem and need help. I have a home built in 1948 with single pane, wooden casement windows. In my living room one wall had 6 fixed casements. Six months ago we repaired the glazing compound on perhaps 1/2 of the windows. Recently we have been experiencing driving rain that is somehow pushing the water past the compound, under the glass, and up the inside of the glass. The water accumulates on the horizontal mullions. The glazing compound is still soft and flexible and paint overlaps the glass so I would think it would create a water proof seal against the window, but that is not happening. When I push against the inside of the widow pane I can see water between the exterior pane surface and the compound move around. I am experiencing this problem on all 18 mullions — both new and old glazing compound. I need to protect these wooden windows as modern replacements will not be appropriate for the interion millwork. I am considering installing plexiglass storm panel which helped in the past, but I want to make the seal between the glass and the wooden frames as tight and water-free as possible. It would appear that there is poor adhesion between either the putty and the glass, or between the putty and the wood frame. Take a putty knife and probe the bond lines at the wood and the glass and see if you can easily separate the putty from either substrate. Glazing putty is a clay-like substance with a high oil content. In the old days, the glaziers used to add linseed oil to the putty to make it more pliable. This could enhance adhesion to the wood by allowing, over time, some of the putty molecules to flow with the oil and penetrate into the wood pores, to create a mechanical bond of sorts. Strictly speaking, the putty will never truly adhere to the glass, but will rather stick to the glass with a sort of oily suction that can repel water if the pressure is not too great. To do a good job of putty glazing, select a high quality oil based sash putty and a little linseed oil to massage into it. Work the putty like clay until it is pliable. Be sure the substrates are clean. Clean the glass with glass cleaner or isopropyl alcohol, and make sure it is dry. It is best that the wood be raw or primed but not finish painted, and of course, clean. Roll the putty into a cigar shape and press it into the space where wood meets glass. With a clean or oiled putty knife, tool the putty on a bevel with gentle pressure. The final strokes should be lengthwise for a smooth finish. There should be no cracks in the putty. Excess can easily be struck off at the face of the wood by drawing a putty knife flat across the face of the wood. Use a flat razor blade on the glass. In order to allow the solvents within the putty to evaporate a bit, leave the putty unpainted at least until it is skinned over and does not readily indent when touched. If you do all of this, your glazing job should resist most water tests that the Good Lord administers. Another option would be to use silicone sealant instead of putty. Select the sealant color carefully – you can’t paint silicone. Don’t cut the silicone with linseed or any other oils. Paint the wood fully, including the finish coat prior to using silicone because it readily adheres to smooth surfaces better that does putty. Good luck, Chris, and let me know how it goes! It is quite interesting to see what some of the possible sources of leaking are in that diagram. If youâ€™re looking for Chicago Replacement Windows try Feldco. See, we allow plugs here! What are your recommendations for glazing an aluminum window from the outside? I am not sure what you are asking. Existing or new window? Sealants? Detail? I mean continuous heel bead or glazing tape and corner toe bead or continuous toe bead or which combination or all of the above? Probably the most secure glazing job will have a hand-applied silicone cap bead on the outside, if done professionally with good surface preparation and joint design. Very few manufacturers do this because it must be done by costly humans rather than machines. This is backed up by a foam tape spacer which resides between glass and outboard glazing leg. A toe bead will add a good second line, however it doesn’t control air at the inboard plane of the glass. Controlling air at the inboard plane is important (this is usually done with a heel bead) because it allows any water that penetrates the primary seal to drain through the weep holes beneath the glass (you need these) without being sucked into the room by pressure differential. Heel beads must not be interrupted by setting blocks or other components, must also have valid joint design, and if they are made with an air-dry sealant, must have some air-time before being covered with the glazing stops. This drying time is difficult to obtain in a factory environment. Back to the exterior seal, low-to-medium performing windows can be successful with a gasket, provided compression is good and corners are reasonably sealed. Higher performing windows seem to be increasingly using two-part structural glazing sealants, machine applied. They set-up quick and resist dislodgement due to shipping, however they are a bear to reglaze. Using structural two-part sealant on the exterior easily doubles reglazing time. I suspect the Glazier’s Union is involved in this conspiracy. What you describe is good for glazing windows from the interior. My question is what would you recommend if glazing a window from the exterior with the glazing stops on the exterior. A cap bead on the interior may or may not be possible. A continuous toe bead or heal bead? Iâ€™m wondering if I could get some advice, now Iâ€™m not a particularly rich person, so replacing the door/windows isnâ€™t really an option at the moment. The back door in my house which leads onto the patio is allowing water to seep through one of the window panes in the door. Iâ€™m wondering if there would be any cheaper options I was thinking of putting like a patio tent/cover up on the patio to prevent the rain from reaching the door. But im worried that the longer I leave the hole in the door the worse it will get? Thanks for a great article with very helpful illustrations. I appreciate how well you have laid out potential sources for leakage. Your site should be of great help as we try to fix some of our current window problems. If we can’t get it under control, I guess I know who to call! What is the best method for repairing a thermal vent leak just to prevent further fogging? Is it really recommended to replace the glass? Surely there must be a fix to stop the fogging from progressing. thanks. We have this horrible black sticky goo that leaks out of our our deck doors under the glass. I have tried to get it off and even paint over it, but it impossible to get rid of. It is so gummy and gooey and looks horrible. Please help! I can send a picture if you need one. I enjoy looking at pictures of horrible black sticky goo. I have the same problem with the black sticky goo. Is there a solution to keep this from recurring? Thanks in advance. Jianjun Yang provided this image of a nickel sulfide inclusion. The encircled area is being analyzed for chemical composition. See next two images for results.